An ash-covered boy standing in a dry season cattle camp (wec) with a woman emerging from a beehive-shaped hut commonly constructed at camps. A small boy next to her stands at the doorway of another small hut covered with bundles of long grass. To the left are windscreens and several goats sitting on the ground. Tethering pegs for cattle are dotted around the courtyard area in the foreground. 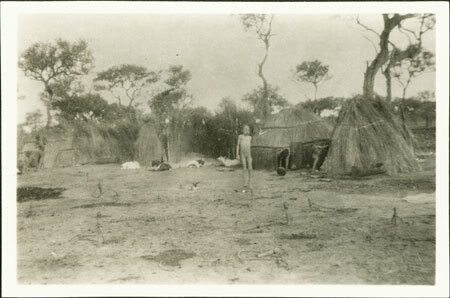 An image showing a dry season forest pool from the same film was published suggesting a location in Lou country. Note on print reverse ms pencil - "32/7 34 88 "
Morton, Chris. "Nuer cattle camp " Southern Sudan Project (in development). 03 Jan. 2006. Pitt Rivers Museum. <http://southernsudan.prm.ox.ac.uk/details/1998.346.88.2/>.